Fossgate has many handsome buildings. Here’s one of them. 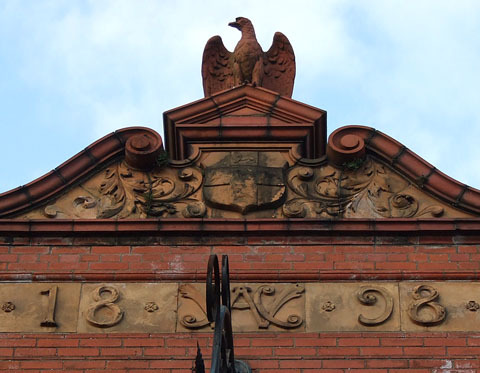 Its fancy frontage is lavishly adorned, topped with an eagle, and proudly proclaims that the building dates from 1898. I’ve taken photos of it several times over the years. But never paid much attention to the ground-floor level. In recent memory it was Fellini’s, then Leila’s tearooms, and more recently still it’s been empty. 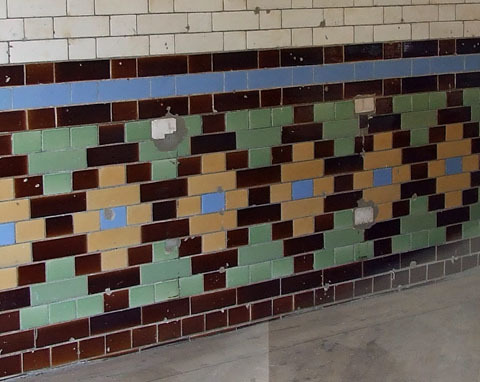 I would have described these as tiles, but on further thought, they must be glazed bricks. They’re in repeating patterns in various colours. This is the lower part. 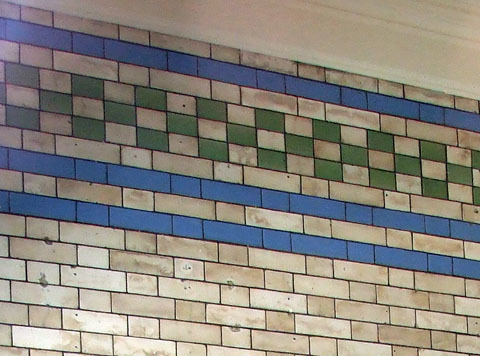 Along the top of the wall, above an area of plain white, blue bands and green in a repeating pattern. 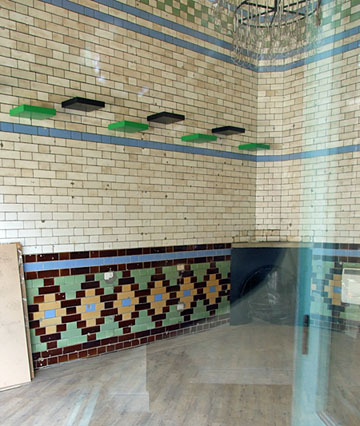 On a later wander with a friend past this shop we were discussing whether they could be an original feature, dating from 1898. They made me think of the 1930s, rather than the late 19th century. I also wondered if they related to the sale of food, back then, early 20th century/late 19th. Why else would you have such a ‘clinical’ surface? Clinical in the sense of being easy to clean, but fancy at the same time, with these carefully-planned coloured patterns. It’s nice to find you were right, isn’t it. 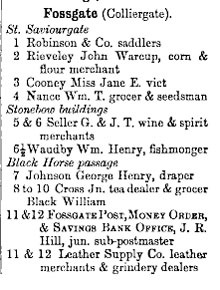 According to old directories and other sources 11-12 Fossgate was a fishmonger’s shop. Even better, our local archives have a photo. 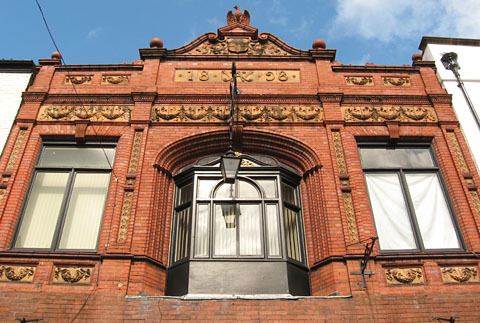 From around 1900, according to www.imagineyork.co.uk (Photo: © City of York Council). 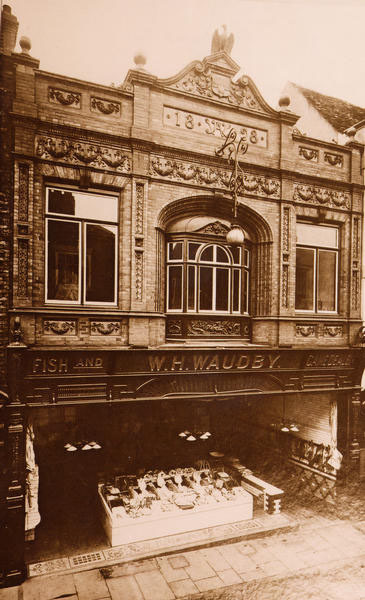 Possibly celebrating the opening of the premises — it’s hard to see why else someone would take a photo of a fish shop, however ornate its frontage. Note the tiling in the geometric pattern, on the right-hand side of the photo. And it’s still there. The same section of wall, looking rather battered now from a century of weathering and people passing through. But still recognisable. 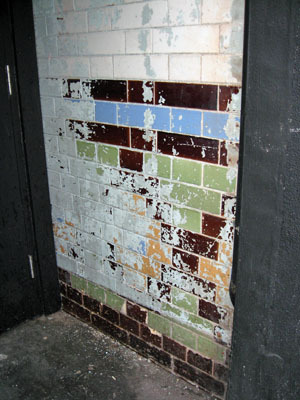 Alterations on the ground floor level in the intervening 100 years or so made a side entrance alongside the 20th century shopfront, with a doorway set back a little from the pavement, which has left this section exposed. Inside the shop it has been better protected. 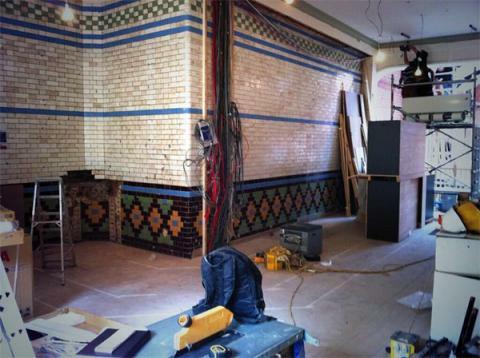 The building is reopening later this month as The Hop, an Ossett Brewery bar. From fresh fish to the finest ales. Hard to be sure now where this was, as the top part of Fossgate was demolished when Stonebow was created. But there was Mr Waudby in his ‘half’ premises, and he got rich enough to build the fine place we now know as 11-12 Fossgate. While we’re waiting for the bar to open, let’s have a look at that impressive frontage again. I wondered what ‘YAC’ could stand for. So if you’re popping in to The Hop on Fossgate, to enjoy its fine ales, raise a glass to William Henry Waudby, won’t you. Hop-based beverages aren’t my thing, but if the ‘finest wines available to humanity’ are also available I’ll raise a glass in honour of his fish, fine frontage, fancy brick, and that eagle. Exactly why I LOVE your website. Not just a fish shop but a Fish and Game Dealer(Right hand side of sign)if you will.